Tá an leabhar réidh anois agus tá líon teoranta ar fáil. €10 an ceann, cuirigí an t-airgead )i gclúdach litreach )chun na scoile go tapaidh chun cinn a fháil sula n-imíonn siad! Ta daoine ag teastáil ar an Satharn seo 8/12 chun iad a dhíol ag Aonach na Nollag i Halla Gillooly, féach thíos. 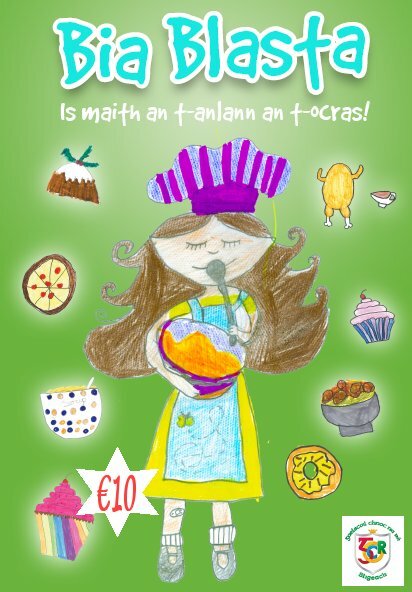 The cookbook is now ready with a limited number available to buy at € 10 each. They make fantastic Christmas presents! Get them while they’re hot! Send money to school in an envelope marked Cairde Cookbook to secure your copies. When they’re gone, they’re gone! We need a few volunteers to sell copies at the Cathedral Christmas Fair this Saturday 8th December in the Gillooly Hall, at the following times: 11-12, 12-1 and 3-4. Contact the school or cairde@cnocnare.net if available. CAIRDE Table Quiz, ar an Aoine seo AR CEAL/CANCELLED. Beidh se ar siúl san athbhliain. It will be held early in the new year. Ceolchoirm na Nollag – AIRE TUISTÍ GACH RANGA!/Christmas Concert – ATTENTION ALL PARENTS! Mar is eol daoibh, beidh an ceolchoirm ar siúl ar 20ú Nollaig. Beidh sólaistí ar fáil agus raifil ar siúl i rith an lae mar is gnáth. Iarraimid ar GACH DUINE ceapairí/nithe bácáilte/brioscaí srl. a thabhairt isteach chuig Club Naomh Mhuire maidin an ceolchoirm. Má tá tú saor ar an lá sin (fiú le haghaidh cuid de) tabhair d’ainm le do thoil don scoil nó do dhuine de na hionadaithe ranga seo a leanas (féach bun an leathanaigh). As you know, the school Christmas concert will take place on the 20th December. Refreshments will be available and a raffle will take place during the concert. We request that parents of children in all classes bring in sandwiches / traybakes / biscuits / buns etc to St Mary’s on the morning of the concert. Raifil – Spotdúiseanna, urraíocht á lorg!/ Raffle – Spotprizes, sponsorship sought! Bheimis buíochas díbh as spotdúiseanna a thabhairt dúinnn nó urraíocht a lorg. Cuirigí isteach iad faoin 18ú le bhur dtoil. We would be grateful if anybody could either sponsor or donate a few more prizes, especially business owners. If you can help please leave items into the school office by the 18th. Míle buíochas libh and Nollag faoi shéan agus faoi mhaise daoibh!